It’s that time of year again! 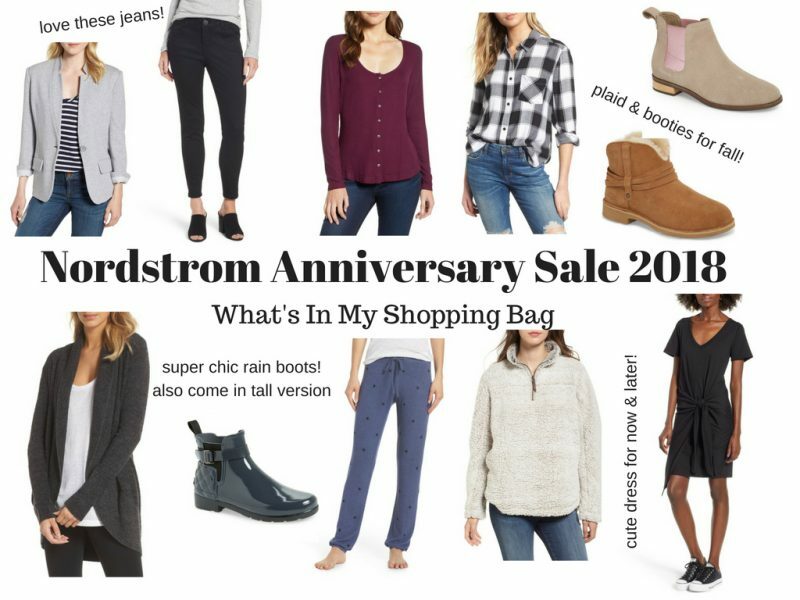 Though I do feel like it is getting earlier and earlier, the Nordstrom Anniversary Sale started yesterday July 12th for early access (Nordstrom cardholders only). While I am going to guess many of you have been inundated with bloggers posting about the sale all over Instagram the last few days, I did want to share what’s in my shopping bag for the sale! PS- if you aren’t a cardholder and don’t want to be, no worries! The sale opens up to the public on July 20th. I would recommend shopping early (and possibly checking back often) in order to get popular items in popular sizes! I always load up on shoes during this sale and this year is no exception- loving the Ugg Pasqual Boot for a more stylish pair of Uggs for Boston winters and the Hunter Chelsea boots for a chic rain boot option. As I’m still getting used to my postpartum body situation, I did want to buy a few classics and past favorites that I knew I would feel comfy in. I talked about my love for Wit & Wisdom jeans last fall and while I’m still trying to get back into my prior size, I ordered the black pair that were on sale. These jeans always have a good amount of stretch which I love! Plaid is always a fall go-to as well and I loved this BP plaid top during last year’s sale (seen here) so I picked up another one in a different color combo this year. Of course because #momlife I did pick up a few cozy weekend pieces like the button front top that I am hoping will be nursing friendly and then this cozy fleece pullover I had eyed last winter but didn’t buy because I was preggers! Every year I get a new pair of Make + Model joggers for hanging around the house. The star print was too cute to resist! Are you shopping the Nordstrom Anniversary Sale? If yes, are you shopping with early access or will you be shopping on July 20th?